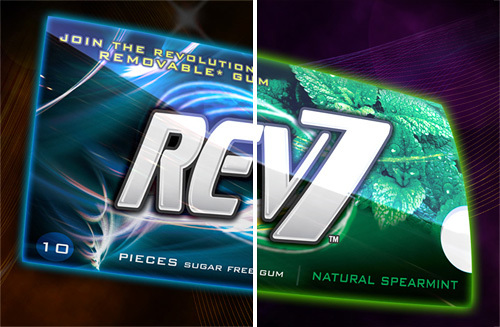 Amphiphilic Rev7 Gum Doesn't Stick Like It Used To (And That's A Good Thing) | OhGizmo! If you’ve ever had to clean gum out of your hair, scrape it off from under a desk or remove it from a carpet, you quickly realize why its hydrophobic (repels water) nature makes it the bane of cleaners everywhere. In fact I was once told that many casinos don’t even sell the stuff because it’s so difficult to clean off their gaudy carpets. But Rev7 is a different story. Its new gum base was developed, based on research conducted at England’s Bristol University, so that it’s amphiphilic. Which means it’s both hydrophobic and hydrophilic at the same time. Its hydrophobic properties allow it to still be chewable and not just dissolve in your mouth immediately. While it’s hydrophilic properties allows water and liquids to penetrate the gum, making it far less sticky to many surfaces and materials, and far easier to clean. If it dissolves in water, it will dissolve in your mouth. I wonder what this stuff does inside human tissue?